Accentuate the style of your home with timber windows from Total Window Repairs. With each and every one of our beautiful timber windows we guarantee you quality, efficiency, durability and security. Settle for nothing less than the best with Total Window Repairs. Durable and Secure Timber Windows from Total Window Repairs. All of our team here at Total Window Repairs are dedicated to helping you to complete your home improvement project in style. Since 2001, we’ve been utilising the greatest materials available on the market to provide customers with timber windows that properly offer a fantastic blend of traditional style with all of the contemporary benefits of modern products. We are incredibly proud of all of the timber products that we supply and fit to customers throughout Dorset. 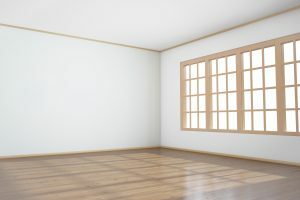 Gone are the days of throwaway timber products that require extensive maintenance and repairs; Total Window Repairs supply and fit high-quality timber products that offer longevity and durability throughout their long lifespan. There are a number of reasons that timber is a fantastic selection of material when it comes to your home improvement project. The most obvious reasoning is the homely design; timber is a fantastic product that has been used in the creation of homes across the world for centuries, offering versatility and durability that outclasses other available materials. 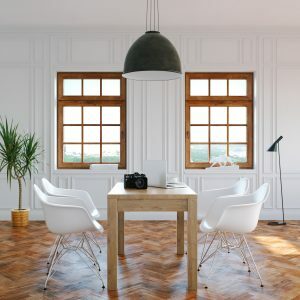 The negative aspects of outdated timber windows construction have since been eradicated, and modern timber boasts all of the traditional flavours and designs with all of the contemporary benefits that come as a standard in modern mechanics. In this case, we utilise fantastic Howarth Timber materials to bring you the best products in the business. Total Window Repairs take the security of all of our timber windows incredibly seriously, and we understand that one of the most integral parts of a possible entryway is that it properly protects your home from unwanted visitors. That’s why we offer a number of security options on top of the already sturdily built wooden profile of our timber windows. We offer a number of hardware modifications and additions to properly protect your home with your new timber windows. The standard range of window handles are available in a number of finishes, and can be found alongside further ironmongery options for added security. As a result, many of our products can be upgraded to Secured by Design status. We are so sure of the quality of our timber windows, and so confident in the improved stability that laminated timber construction provides, that we are proud to offer guarantees for up to ten years on our paint finishing, and six years on our stain finishes. More details about these guarantees are available for any customers upon request. Feel free to ask our team! 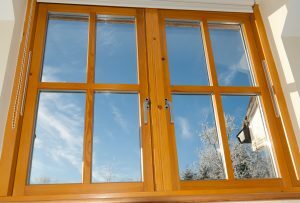 Here at Total Window Repairs, we understand that security, thermal efficiency and durability are all key factors in providing new timber windows. However they are not the only important features; it’s perfectly reasonable to assume that the modern day customer wants products that properly reflect their personal aesthetics, while matching the existing décor of the property itself. With a variety of stain and paint options for customers to select from, you’ll easily be able to find the timber windows that suit you and your home. We offer a number of standard paint and stain finishes from Oak to Rosewood, from Copper Brown to Buttermilk. Our frames are available in most standard RAL colours, except Signal White, RAL9003 and no darker than Grey RAL7015. We also offer a number of intriguing timber window designs, so you can rest assured that you’ll be spoilt for choice when it comes to selecting the perfect timber windows. We also offer fantastic leading options, available in either 9mm or 12mm thickness depending on your preference or needs. We offer our square and diamond patterns as a standard, applied to the external pane on both sides. For the very best timber windows in Blandford Forum and the surrounding areas, get in contact with Total Window Repairs today. If you want the perfect double glazing to suit your property then call our team on 01747 812666. Our specialist team would be happy to help you find a bespoke product that suits your exact timber windows needs and requirements. Alternatively, feel free to contact us via our official form. One of our specialists will get back in touch with you as soon as possible. Finally, if you prefer you can access and utilise our simple quotation tool. This handy little implement allows you to find an instant timber window price, tailored to your specifications. We look forward to hearing from you! What Warranties Do You Offer For Replacement Double Glazing Units?